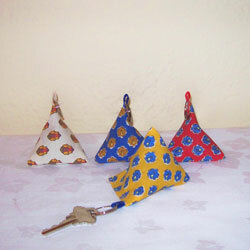 Made from French provencal fabric, these key rings are filled with lavender. Each time you squeeze the key ring, you will smell the fragrance of the South of France. The key rings measure approximately 2 1/2 inches at the seams. If you prefer a specific color fabric, just note your prefernce in the Comments section of the order form.